Production I.G has announced through the latest issue of Monthly Young Magazine that a new Ghost in the Shell television series is in production and will begin airing later in 2013. 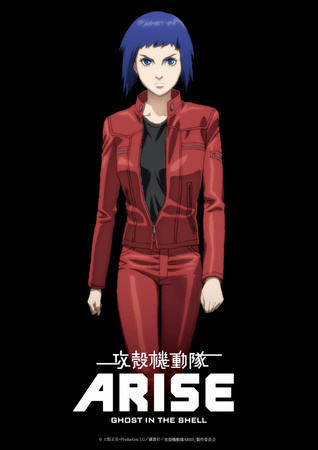 Entitled Ghost in the Shell: Arise, the series appears to be a reboot of the universe, with a new incarnation of protagonist Motoko Kusanagi. The series will be directed by Kazuchika Kise and will not see involvement from Kenji Kamiyama, who served as director on both Ghost in the Shell: Stand Alone Complex and S.A.C. 2nd Gig. Both seasons of the previous Ghost in the Shell series originally aired from 2002-2005. Artwork of the new take on Major Motoko Kusanagi. On the recently launched official website, it has also been announced that a live special production presentation will air on YouTube, Niconico, and Bandai Channel at 9:00PM local time in Japan on February 12th. In the meantime, you can also follow information on Ghost in the Shell: Arise on newly established Twitter and Facebook accounts. All sites are in Japanese.